Dubai aims to generate 50% of the site’s energy needs from renewable resources, and half of this will be generated on the site itself. 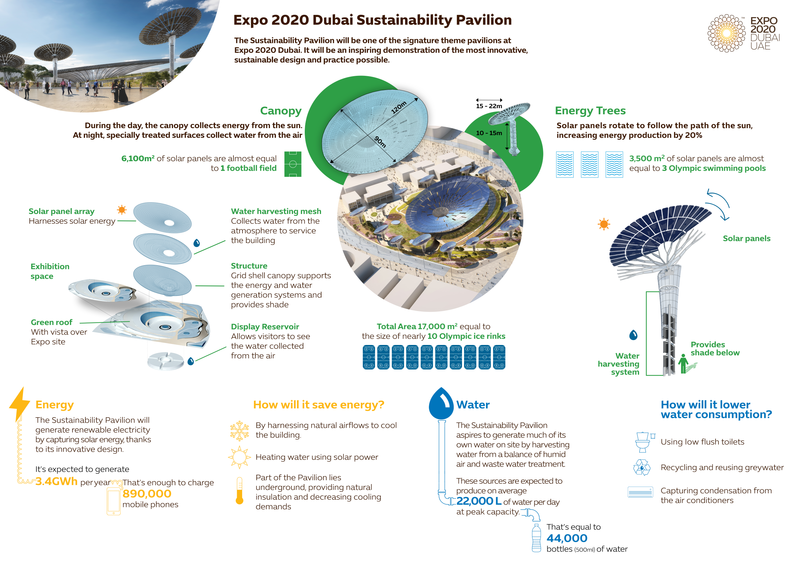 The Sustainability Pavilion will be one of the signature theme pavilions at Expo2020 in Dubai. The Sustainability Plaza will have a very innovative and sustainable design. The canopy collects sun energy during the day. At night it will collect water from the air. The circular canopy measures 120x90meters and is covered with 6,100m2 of solar panels. The solar panels will be installed on steel rings forming the shape of the canopy. Kersten has bent steel tubes Ø323 and Ø273mm with thickness of 10 to 50mm. The urban impact on Dubai is very big. Over 440 hectares of dessert have been transformed into an innovative architectural landscape. They also have to take care of all the amenities and facilities to welcome up to 250,000 visitors per day!